Hex to decimal converter or short hex to dec converter is a nice online tool that helps you to convert numbers expressed in the hexadecimal (hex) format to the decimal (dec) format. The hex to decimal converter tool is very useful especially for web developers as they often need to convert from hex to dec and the other way around. Nice hex to dec tool isn't it? This hex to dec converter works in reverse order as well. To convert from binary, enter ones by clicking the small check boxes. To convert from decimal, enter the number in the appropriate box, and then click outside the box. If you need to convert large decimal numbers, you might want to take a look at our Dec to hex converter. How do these numbers translate to colors? Every color is composed of red, green, and blue. Each flavor of these color can be expressed in decimal or hexadecimal numbers. If you mix three decimal or hexadecimal numbers, you get a color. How does it work? Take a look at our RGB color picker. The hex to decimal conversion and the logic behind the hex to decimal converter (hex to dec converter) is pretty simple. Converting hex to dec is a two step process in which you first convert from hex to binary and then from binary to decimal. Why does hexadecimal E equal to binary 1110, and why hexadecimal 7 equals to binary 0111? That is how it has been defined, that is how it works, and this relationship can be seen in the following Hex to decimal conversion table. Ok, so far we know that the hexadecimal E7 translates to binary 11100111. Now, how do we convert this to decimal? This step in the hex to decimal conversion process is as easy as the previous hex to binary step. 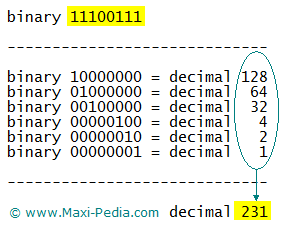 From a table provided and explained on the dec to hex converter page (see the Dec to Hex and Bin conversion table (expanded above 4 bits)), we know that the first 1 in our example binary 11100111 equals to decimal 27 that is decimal 128. The second 1 in 11100111 equals to decimal 26 that is 64. The third 1 in 11100111 equals to decimal 25 that is decimal 32. As we are deciphering the whole byte, we need to add all numbers up. In our case, all the ones result in 128 + 64 + 32 + 4 + 2 + 1 which equals to 231. Thus, we came to a conclusion using our hex to decimal converter based on the hex to dec conversion process that hexadecimal E7 equals to binary 11100111 and that equals to decimal 231. In case you have any questions about the hex to dec conversion process, you can ask questions in our discussion forum. Anything else besides the hex to dec converter? Of course, we have a lot of other interesting stuff besides the hex to decimal converter.